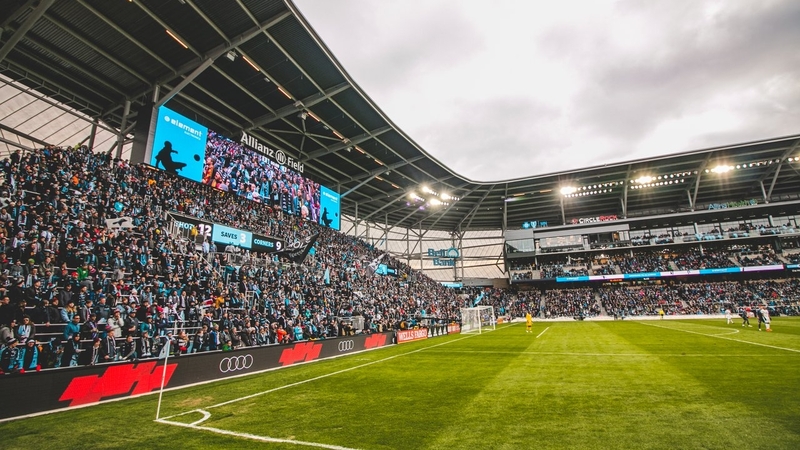 Minnesota United played the first-ever match at Allianz Field on April 13. Here’s what you need to know about this incredible new soccer stadium in Saint Paul. In 2016, Minnesota’s own Mortenson Construction broke ground on the $250 million privately-funded MLS soccer stadium on the site of a former bus lot at Snelling and University in Saint Paul. Mortenson had most recently built U.S. Bank Stadium, home to the Minnesota Vikings, and also played a role in the construction of TCF Bank Stadium, Target Field and Xcel Energy Center. The building of a soccer-specific stadium represents a dedication to the future of soccer in Minnesota. The state’s MLS team, Minnesota United, had been playing games at TCF Bank Stadium in Minneapolis since joining the league in 2017. Prior to that, Minnesota United was part of the North American Soccer League and played out of the National Sports Center in Blaine. For more fun facts on the team, check out our Get To Know MNUFC blog. 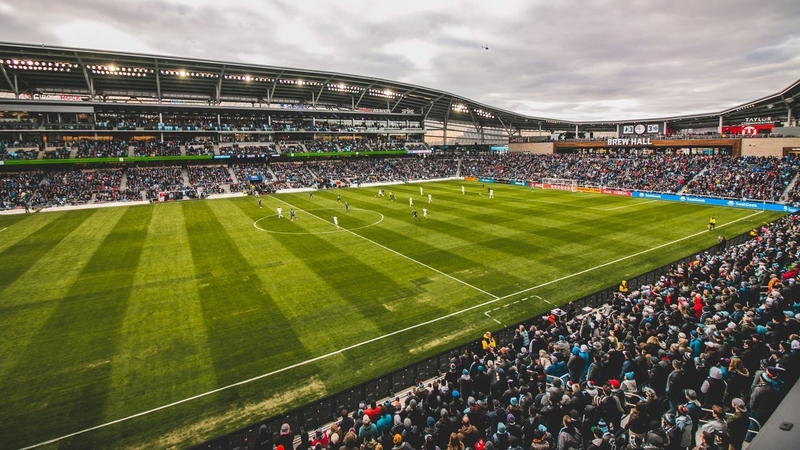 In addition to bringing in fans across the Midwest, Allianz will go international when it hosts a doubleheader in the 2019 Concacaf Gold Cup on June 18—the biennial men’s soccer championship between the North American, Central American and Caribbean regions. Tickets for the event at Allianz were gone in a flash in what was the fastest sellout in Gold Cup history. 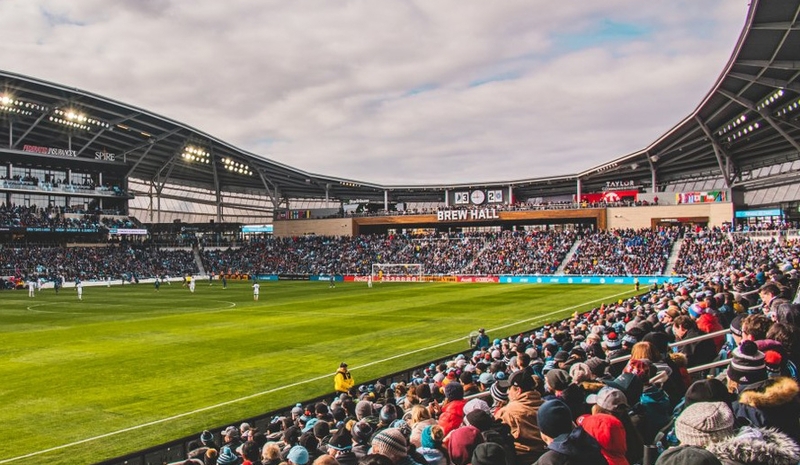 Pronounced ahh-lee-ahnz, Allianz Field is sponsored by Allianz Life—a Golden Valley-headquartered subsidiary of German financial company, Allianz, who sponsors seven other major sports facilities around the world. Allianz was inspired by Minnesota’s natural wonders—the Northern Lights, great rivers and countless lakes. The bowl-shaped stadium features a first-of-its-kind glass-like mesh exterior with an extensive LED lighting system, enabling it to illuminate in an endless combination of colors and designs. The stadium will seat 19,400 on opening day, with plans for future expansion of up to 24,474. The north end features a Brew Hall serving up 96 taps and full food service to all MNUFC fans. This is also where you’ll find the Black and Blue Official Team Store, where you can get all sorts of team swag—including on-site jersey customization. This Fanatics Experience store in the northwest corner will be open year-round to the public. Wondering where you’ll find rambunctious supporter groups like Dark Clouds and True North Elite? These rowdy, energetic fans will be leading cheers and getting the crowd hyped from the general admission MNUFC Supporter sections on the south end of the stadium. Designed for more than just aesthetics, the 360-degree canopy, open roof, natural grass and exclusive use of LED lights make for an incredibly low-energy footprint. Rainwater collected from the roof canopy will flow into a central stormwater system that will serve the 35-acre development surrounding the stadium. Allianz Field is serving up more than your garden-variety stadium food (though they have that, too). In addition to all of the family favorites, you'll find a wide variety of dishes representing the area's diverse local flavors. 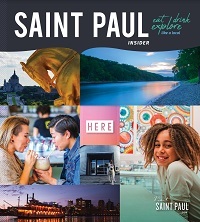 Offerings with Saint Paul ties include barbecue sandwiches from Handsome Hog, sambusas from Afro Deli, burritos from Brasa, tacos from El Burrito Mercado, baked goods from Buttered Tin, gourmet nachos from Los Ocampo and hot pastrami from the iconic Cecil's Deli. And that's not even the half of it—there will also be Food Truck tailgate parties open to the public outside the stadium (do not require a ticket) and convenience store-style mini markets throughout the concourse where you can grab sandwiches, snacks and beer on the go. And remember the Brew Hall? Not only will it serve up tasty eats on game day, it'll also be open to the public every Thursday-Sunday with the potential to also open during more unconventional hours for viewing of European and other international matches. Outside, you’ll find 2.6 acres of outdoor gathering space. Most notably will be The Great Lawn—a 28,000-square-foot space on the north side of the stadium. Nearly 200 trees were planted for these public spaces, including a host of native maple trees with fun names like Autumn Blaze, Fall Fiesta Sugar, and Northwood Red. Allianz is immediately adjacent to the Snelling Avenue Metro Transit Green Line station, making arrival and departure incredibly convenient for fans—even on the busiest of game days. Taking public transit is highly encouraged and MNUFC has put together a comprehensive transportation guide with routes for all methods of arrival—biking, park-and-ride, metro transit light rail or bus, ride share and driving. There’s no shortage of spots to grab a bite to eat or toss a few back before and after the match. Black Hart of Saint Paul: Soccer fanatics, this is your headquarters. This LGBTQ+ soccer bar is walking distance from Allianz off University. University Avenue: It’s tough to find a more diverse and delicious collection of dining options in the Twin Cities than Saint Paul’s University Avenue. Some of our favorite spots are easily accessible from Allianz by foot or the green line. 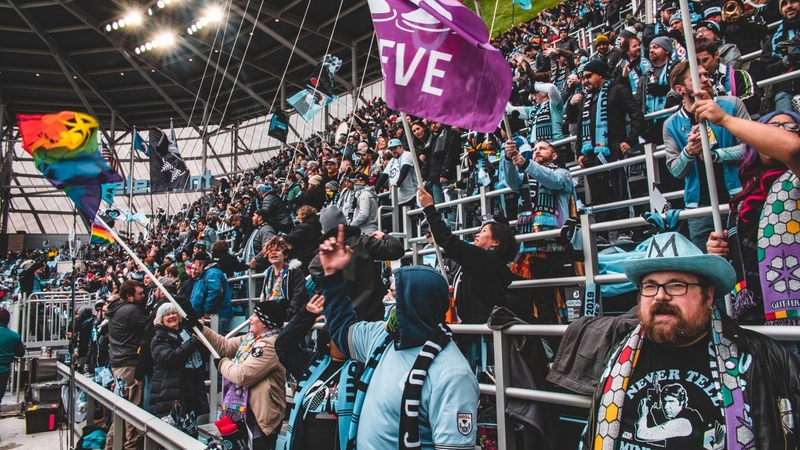 We absolutely cannot wait for all the fun to be had at Allianz Field starting this spring. Share your own excitement with us on Facebook, Instagram and Twitter using the hashtag #MYSAINTPAUL!